While out trick-or-treating, you may notice a teal colored pumpkin on someone's doorstep. What does this mean? Is it a fun decoration or something more? Well, the answer is that it is something more. The teal pumpkin project was started as a way to help kids with food allergies have a happy and safe Halloween experience. As we all know, many of the candies that are given out contain nuts or are processed in factories where the food can come into contain with nut-based products. 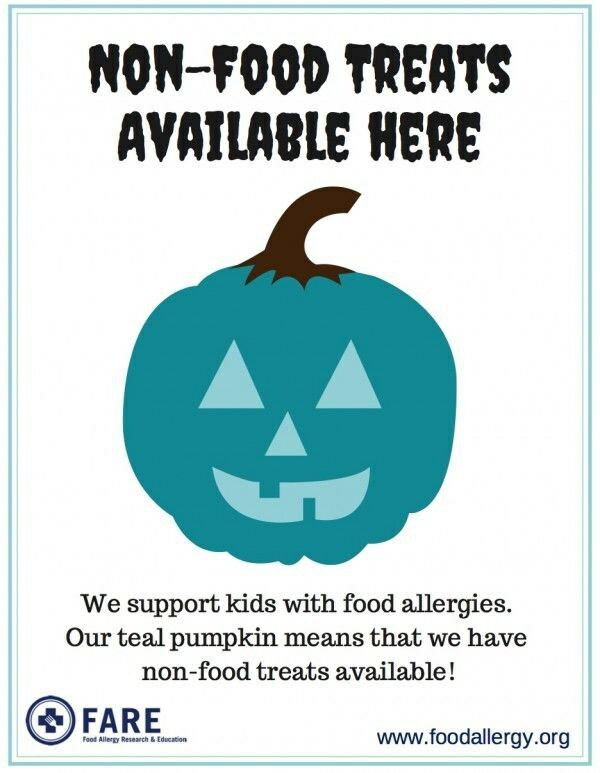 So, in order to help the children with nut and other food allergies, the Teal Pumpkin Project was created. The project is sponsored by FARE: Food Allergy Research and Education. If someone has a teal colored pumpkin out on Halloween, this means that they have alternatives to candy and food items. This may include little trinkets such as necklaces, Halloween pencils and much more. In addition to having a teal pumpkin, you may consider having one of the official signs in your windows to show that your house is participating such as the one shown below.